Toddler Activity Island - A Tropical Learning Journey! How would you like to play snap against a crocodile? Count jumping dolphins? Play a tune with musical birds of paradise? Or play with shells on a tropical beach? Far across the ocean lies a very special island where the animals do the most extraordinary things. Why not take a trip across the sea to visit them and join in their fun? Aimed at preschoolers in the initial stages of mastering the basic skills and specially developed to be simple to use. Activity Island features four entertaining games which enhance children’s knowledge of basic numeracy, promotes visual discrimination skills and allows the development of creativity. ● Down by the river lives the crocodile who loves to play snap - he’s very quick at spotting which pairs of animals are the same so be sure to shout ‘SNAP!’ (or tap on his mouth) as soon as you see two that match. Can you beat him to three correct answers? Increase the speed of play once you become a snap expert and challenge the crafty croc to an express version of the game. Note : iPhone or iPod with mic needed for shouting snap to work! To enable the microphone, please go to the info page from the map screen. ● Deep in the rainforest sit the beautiful singing birds of paradise who can sing you five traditional nursery rhymes. You can sing and play along, deciding on the tempo as you listen-will it be fast (tap on the cheetah) or slow (tap on the tortoise)? Or if you’d prefer you can create your very own singing birds musical composition using any of the notes from the octave they can sing. ● Out to sea the number dolphins enjoy jumping above the waves - can you tap each one to count how many there are? The number you count can be heard and seen. Once you master counting to 10 why not try counting 20! They can also jump in pairs so you can count along in twos. ● Down by the beautiful blue lagoon can you find the matching pairs of cards? Hidden behind each of the 8 cards is an animal, see how quickly you can find the matching pairs. Hear the noise each animal makes as the card is turned over. When you arrive unfurl your map by tapping on the Activity Island text to choose where you’d like to visit first. Click on the (i) in the bottom left corner to change settings, or select the game you'd like to play by tapping on the creature. 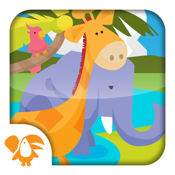 Play snap by either tapping on the crocs mouth or shouting snap when the animals match. The difficulty setting can be changed in the games settings, along with the microphone sensitivity. If you like Activity Island you might also like to have a look at Bumble's Jumble - Toddler Puzzles and Toddler Activity Farm both from eduGAME. Follow us on Twitter @edugame_uk for promotions and news on our latest apps. If you have any problems with our apps please email support@edugame.co.uk before leaving a review and we'll do our best to sort it!